Write stuff: This software programmer-turned-editor, with 17 titles to her credit, has taught many Indian children how to rhyme. Fifteen years ago, Anushka Ravishankar went looking for some Indian children’s books for her then six-year-old daughter. She couldn’t find any of the kind she wanted. Ravishankar’s stories, most written in verse form with the sort of metre and rhyme that would make Dr Seuss proud, were good. From Alphabets are Amazing Animals toExcuse Me, Is This India?, Ravishankar’s books of nonsense verse have become popular with several generations of children. 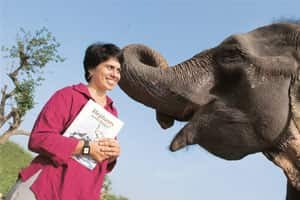 With 17 children’s books to her credit, Ravishankar—she should not be confused with Anoushka Shankar, the sitar-playing daughter of Pandit Ravi Shankar—is among the best known Indian children’s writers in the business. The children’s section of most large bookstores is usually filled with books written by foreign authors. There are not too many Indian authors specializing in fiction for young children, the four- to eight-year-olds who are beginning to read on their own and need whatever they are reading to have a certain cadence and metre to retain their interest. And the few Indian books available for such children are published by small firms, with their production quality leaving a lot to be desired . Aniyan Nair, head of operations and marketing at bookstore chain Crossword Bookstores Ltd, says the children’s books at his stores are “predominantly by foreign authors." “We need to have more writers and publishers (and) encourage more writers to come into the genre," Nair adds. Ravishankar’s books aren’t inexpensive. They cost anywhere between Rs150 and Rs350. And they are printed on good paper and, sometimes, hardbound. Most of her books are published by Tara Publishing, a Chennai-based publishing house that has made a name for itself in the area of children’s literature. “The work she has produced for us is world class... She is one of the most important writers for us," says Gita Wolf, publisher of Tara. “I think she is one of the most innovative and talented children’s book writers... She will take her definite place in world literature," she adds. Ravishankar was born and grew up in Nashik and went to college in Pune. She graduated in mathematics from the city’s Fergusson College in 1981. “I was always interested in writing, though I started with bad poetry," she says. It was while she was in college that she was exposed to the nonsense verse of Lewis Carrol, Edward Lear and Edward Gorey. “I completely got hooked," she says. After completing her post-graduation in operational research, she took up a job as a software programmer in a Nashik-based company but it became difficult for her to continue to work after the birth of her daughter. That gave her time to write. She sent a few stories she had written for her daughter to a children’s comic magazine called Tinkle. Two of the stories won a contest organized by the magazine and the publisher offered Ravishankar a job. Ravishankar’s daughter was still young, though, and she could only freelance for Tinkle. Ravishankar’s family moved to Chennai in 1996 when her husband took up a job in the city. She was immediately hired as an editor by Tara Publishing, a company that had been founded in 1994 with the objective of producing good quality children’s books. Ravishankar decided to publish some of her own stories. Then, she authored Tiger On A Tree, a book of nonsense verse that was published in the US, and translated into Japanese, Korean and French. The book won the Star of Excellence award from France’s National Union of Culture and Libraries in 1999. Nonsense verse doesn’t have much of a following in India, says Ravishankar. Tiger On A Tree sold only about 2,500 copies in the country whereas the book sold 10,000 copies in the US and 7,000 in France. “People think it’s a genre for children. It’s not... Anyone can enjoy it," she adds. “Children are more open to that, that’s why children enjoy nonsense much," adds Ravishankar. “As you grow older… you lose the ability to accept nonsense." Ravishankar may be a name in the field of children’s fiction, but that doesn’t mean she is a well-known figure in the country. A Chennai newspaper once carried news of the launch of one of her books along with a picture of Anoushka Shankar. The next day, the paper carried a clarification. Ravishankar, now an associate editor at the Indian arm of children’s books publisher Scholastic, a firm known for publishing the Harry Potter series in the US, says that children in India are conditioned to read more as a learning exercise and very rarely they read something for just pure fun. “They are also so brainwashed …If you ask children they will say we read this because we learn this," she adds. “They don’t understand that you just read for fun." Ravishankar says this is one reason why she writes stories that are fun to read. “I don’t write to teach or moralize anything," she says. “You could end up finding messages but consciously I have never tried to do that." In the process, she has also taught countless Indian children (and their parents) how to rhyme—even if it is only nonsense.